We are back in our respective homes after a whirlwind tour around the UK. We played in some amazing venues from Stornoway to Devon, and every single show was a blast. We managed to get some good video recordings from our show in the charming Burnett’s Hill Chapel in Wales. Here’s the first one we’ve edited together – Chop It Up, featuring Amadou Diagne. A few more to come soon. Thanks to everyone who came along to the gigs! Check out where we will be playing here. We are really looking forward to playing a bunch of shows all around Scotland in the next couple of weeks. We’ll be joined at the shows by percussionists Pete Vilk (for the first two) and Amadou Diagne (for the others). Hope to see you there! Don’t hesitate to get in touch if you have any questions about any of the shows. The tour is made possible thanks to support from Creative Scotland. Howdy folks, Yann and I are getting together for a couple of shows in Paris next week at l’Alimentation Générale and at the Paris-Prague Jazz Club. Check out our shows page for details. We are also favorably reviewed in the latest Songlines magazine – check out the review here. Lastly, we’ll be touring around Scotland in early May, so stay tuned for that info! 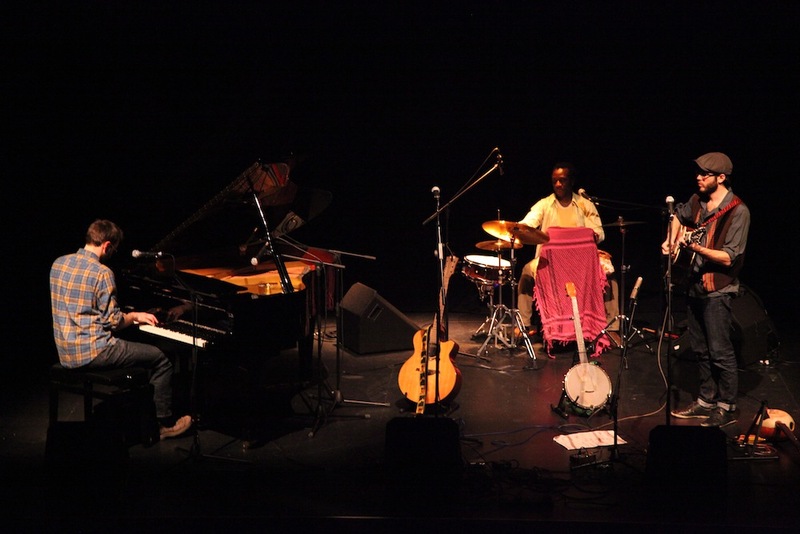 After a great little tour of England where we played as a duo and also joined forces with some wonderful musicians (Amadou Diagne, Griselda Sanderson, and Paul Clifford), Yann is now back in Scotland and Cory back in France. Check back soon as we are in the midst of planning future tours and recordings and all that. In the meantime, we have had some great reviews of Jagged Land. Read them here. Howdy folks, we’re on tour from September 13-22 in the UK…check out the list of dates here. We’ll be joined by percussionist extraordinaire Amadou Diagne for the first four shows. In other news, we received a great review of our album in Americana UK. Read it here. Long Red Road is another mish-mash of lyrical themes and musical ideas that I culled together over the years. I first came up with the banjo line when I was living in Brooklyn (i.e. about 5 years ago! ), and I had completely forgotten about it until it all of a sudden reappeared very clearly in my mind just as we were beginning work on the album. This reminds me of how our grandfather, who had dementia in the last years of his life, could not remember where he was or who many of the people were around him, yet could conjure up any song that he had learned in his past without batting an eye. It’s as if melodies, rhythms, grooves are all just floating around us looking for an available portal to express themselves, even if that portal is not quite right in other ways! In any case, Yann and I fleshed the tune out relatively easily as it was patently clear at the time what we wanted to do with it (it only took 4 years after the tune first came to me! ): make it a sort of contemporary folk tune with west African percussion. We liked the idea of having a laid-back, melancholic clawhammer banjo line floating gently over rhythm guitar (played by Yann) and upright bass (played by Stephen Harrison), while Renaud Ollivier’s excellent calabash playing peppers the tune with just the right dose of west African groove. Finally, the charango comes in a little later for the extra sparkle we were looking for to conclude. The lyrics of the chorus were inspired by a trip my wife and I made to Mali in 2010. We were very fortunate to have travelled around the country from Bamako up to Timbuktu and out to the Dogon country. All this before things took a dramatic turn for the worse several months later with the repeated kidnappings and now a coup d’état and an explosive Touareg rebellion fueled by a hefty dose of Algerian islamism. When we weren’t on the Niger River, to get to and fro we would travel down long, seemingly endless stretches of rusty red, laterite roads. At one point between Timbuktu and Douentza, the AC in the 4×4 we were in stopped working, so we had to roll down the windows to escape the unbearable heat. The trade-off however, was that all the dust from the road was steadily blowing into the vehicle without us really being aware of it until we looked at one another and realized we were completely coated in crimson red! I think the rest of the lyrics have to do with the strangeness of being able to travel all around the world so easily and never quite grasping what it all means. From the winter grey of Paris to the hot laterite of Mali and elsewhere, the driving notion is this idea of a “casual waltz through others’ lives”, i.e. to the Antipodes to leave behind your own issues. There’s no better therapy than a great trip! But a very strange phenomenon it is to be able to just land in someone else’s reality to escape your own. Also, the line “I’ll show you how to live with fire in your eyes if my heart you show me how to protect” probably has something to do with adventure vs security both in terms of travel and in terms of relationships. Guess it’s love song meets travel chronicle, the latter of which leads me to why I chose to write a post about this song – because of its relevance to the current crisis in Mali. Perhaps there was some sense of premonition, at the very least in Timbuktu where the “casual waltz” of being an outsider, a traveller, a tourist was made tense and uneasy by the smoldering smell of conflict. Argh. I’m stopping there as I’m probably getting ahead of myself. Chop It Up is a classic example of the random collision of ideas floating around in my head when I put a tune together. It involves, as for most people who create stuff, extrapolating bits and pieces of ideas from radically different sources to try and concoct something original and new (to varying degrees of success!). The world music scene has been making cross-cultural sounds for a long time now, so I suppose that my inclination to mix things up originally came from this. In addition, I have the internet to thank for all the incredible information I have at my fingertips. If it were not for me obtaining a copy, probably via my digitizing brother, of African Fingerstyle Guitar by Gerhard Kubik, I would never have discovered Daniel Kachamba, an unknown, deceased Malawian guitarist, whose style of guitar playing I can safely say revolutionized my view of how to play fingerstyle guitar. I spent hours poring over the songs he recorded for Kubik to try and understand the deceiving simplicity of his technique. After grasping what his right hand was doing – a thumb-index driving rumba in which the index finger plays occasional bass notes for extra rhythmic attack – I started applying this to all manner of songs and compositions. Chop It Up, therefore, is straight up Kachamba rhythmically speaking. The difference is that harmonically I incorporated minor key infused lines and licks inspired by Malian guitar music as well as, and perhaps more importantly, the slaying guitar on the Kenyan collection, Before Benga vol. 1 (listen here) – particularly the scorcher, Usimalize Mali by Williamu Osale. Then of course come the lyrics, always the last part to exit the creative womb! I’m not a huge fan of analyzing my own lyrics, probably because either they don’t make much sense or they hit too close to home for me to want to revisit where I was when they bubbled up from my subconscious. In this case, all I can say is that they were inspired by a period in my life when I was spending a lot of time in the Maryland woods chopping and sawing logs up into firewood and lumber. The latter was part of a project to turn a bunch of felled oak trees into flooring, which involved me and my dad strapping the wood to pallets on a trailer that we hauled in a pickup to a Mennonite run saw mill in the far reaches of western Maryland (hence the line: “Hook it up, tie it with the right knots, Hand it to the bearded men, who route and plane in the name of God”). It felt like a trip into the 19th century, what with old barns and houses decorating the landscape (aside from the occasional McMansion) and these pious, hard-working men in the middle of the beautiful, mountainous countryside taking our wood and milling it up into flooring for us at an extremely reasonable cost. The name of the place? The Hicksville Planing Mill. Perfect. Once the wood was brought back we needed to let it dry a little longer, so as to have a low enough moisture content that the wood wouldn’t warp once put in. I was constantly amazed at how much wood moved and warped even in the best drying conditions (strapped down with stickers to help it all breathe, etc. Hence the line: “Load it in, lay it in the right way, even when it’s tied down it’ll still take its own shape”…Read what you want into that one. The rest of the lyrics are essentially hazy phrases that I conjured up to express my general befuddlement at the strange, wonderful, melancholic loneliness of life. It was great fun putting all this together with Yann, who was at the recording/mixing helm and who did some excellent keyboard work on this, harmonizing with my guitar line and adding nice bass lines. I also love the percussion by Renaud Ollivier who provided the deep calabash pocket, and thanks to Pete Vilk and Paul Clifford who added some really tasteful percussiveness (shakers and such) to the whole thing. An Audience That Cares was written quite a long time ago now, several years before we even recorded it for Jagged Land. I can pinpoint the date exactly, because it was while I was working as a musician in a panto at the Dundee Rep Theatre in 2007. If you are not British the term “panto” may mean nothing to you – I certainly had no idea what I was getting into when I took the job. They occur all over the UK each winter, generally starting at the beginning of December, and are rollicking and somewhat bawdy versions of children’s stories, often featuring washed-up soap opera stars or stand-up comedians. Aimed primarily at the 4-12 year old crowd and their parents, they will invariably feature a man dressed as a woman, sometimes a woman dressed as a man, and a ‘baddie’. The crowd is encouraged to shout at the performers, including the classic “He’s behind you!” and there will often be a fair amount of improv and general chaos. To a foreigner like me it all seems fascinatingly medieval. In any case, I was hired to play guitar, piano, trumpet, and bass in Jack and the Beanstalk. I should point out that as one of the best theatres in the country this production did not have all of hallmarks of a traditional panto (no washed-up stars, sadly), but was an extremely good gig – particularly for a broke musician desperate for work. I was so desperate, in fact, that I took this job despite knowing that it would prevent me from heading back to Maryland for Christmas for the first time, and would instead send me to Dundee every day for 60 odd shows, often two a day. We are good to go! We are very pleased to launch the brand new Seznec Bros website, Facebook page, and most of all our new album Jagged Land. You can buy the album in a number of different ways, on Bandcamp, CD Baby, iTunes and Amazon Digital. For details please see our Music page, where you can also listen to both Jagged Land and our older album Sediment. Please be sure to ‘Like’ the Seznec Bros on Facebook, either in the snazzy box on the left of this page or on our Facebook Page, where we will be posting updates, photos, music, and more.